Answer: The term heat lightning is a bit of a misnomer. It is so called because it’s often seen in the hotter months of the year, when thunderstorms are common. But the lightning itself is the same as “normal” lightning. It’s just so far away you can’t hear its thunder. A good sized lightning bolt puts out a tremendously bright flash of light. It illuminates the ground below, the cloud above, and can be visible from hundreds of miles away. Because the Earth is round, a ground-level observer’s horizon will be about 3 miles distant. 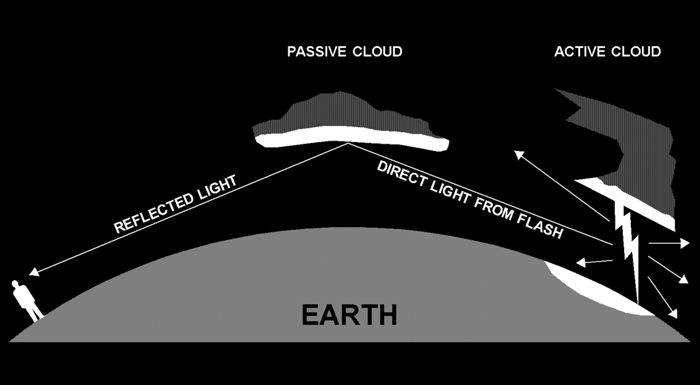 If the active clouds are beyond your horizon, and you have some passive clouds in the right place to reflect the flash of light, you’ll see those passive clouds light up, but you won’t see the actual lightning bolt. Most of the time you won’t hear the thunder either, simply because it’s so far away. That’s why this phenomena is also known as silent lightning. But all lightning bolts make thunder. Sometimes, under the right conditions, you’ll see the actual bolt but not hear the thunder. Sound waves can be diverted by air masses of varying temperature. More so than light waves. But somewhere, perhaps not far from you, it’ll definitely go boom for somebody.